This new magic trick has caused magicians worldwide to shout in wide-eyed surprise. Three coins magically vanish as they appear to melt into an illustration you've drawn on a memo pad. You can tear the page from the pad and give it to your spectator at the end. 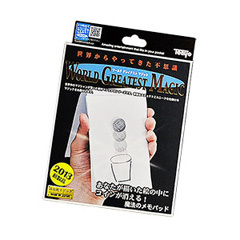 Thanks to a brand-new specially constructed gimmick, you will be able to perform an incredibly visual effect that looks like real magic. The gimmick has been built into a perfectly ordinary memo pad, so you'll always be ready to perform with the most natural of props. Use any coin available to you -- U.S. quarter, 50 cent Euro, etc.